1st Battery: No return. Captain Albert W. Bradbury resumed command of the battery after July. Battery remained assigned to First Division, Nineteenth Corps, Department of the Gulf. After the fall of Port Hudson, the battery moved with its parent formation back to Baton Rouge. Reports earlier in the year gave the battery had four 6-pdr rifled guns and three 12-pdr howitzers. 2nd Battery: “In the field” with four (down from six) 3-inch Ordnance rifles. This is Captain James A. Hall’s battery, First Corps, Army of the Potomac. Hall was up for promotion later in the year. 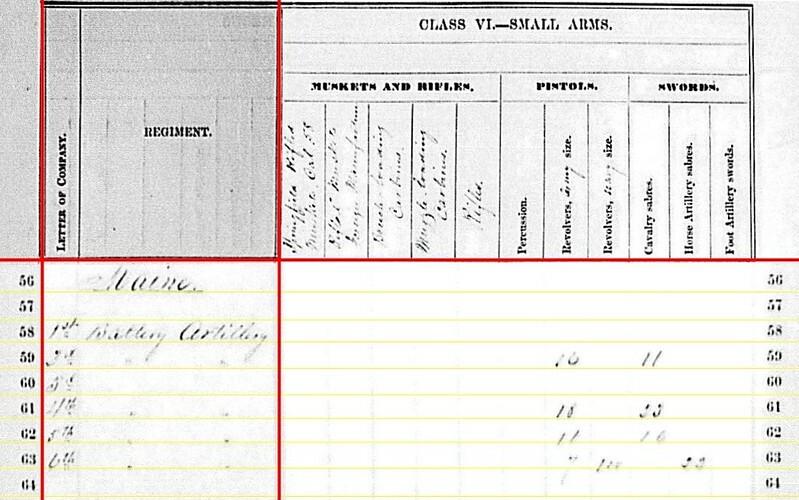 “In the field” was in Culpeper County, as of the end of September, 1863. The battery would report to Camp Barry in November. And around the same time, Hall would receive a much deserved promotion (and soon command the artillery school at Camp Barry). 3rd Battery: No report. At this stage of the war, 3rd Battery was re-designated Battery M, 1st Maine Heavy Artillery (it would later revert to light artillery). Captain James G. Swett commanded. The battery was stationed in the Defenses of Washington, on the north side of the Potomac. They were, for at least a portion of this time, assigned to Battery Jameson, outside Fort Lincoln. 4th Battery: Reporting at Culpeper, Virginia with six 3-inch Ordnance rifles. Captain O’Neil W. Robinson, Jr. remained in command. The battery returned to the Army of the Potomac, as part of French’s Division, under Third Corps. 5th Battery: Reporting, appropriately “in the field” with four (down from six) 12-pdr Napoleons, from a report filed in March 1864. Captain Greenleaf T. Stevens remained in command of this battery, which remained with First Corps, Army of the Potomac, through the end of the reporting period. As such, its location was “in the field” in Culpeper County, Virginia. 6th Battery: Another battery reporting from Culpeper, Virginia, in January 1864, this time with four 12-pdr Napoleons. The battery transferred from the 4th Volunteer Brigade, Artillery Reserve, Army of the Potomac to the 1st Volunteer Brigade (commanded by its original commander – Lieutenant Colonel Freeman McGilvery. Lieutenant William H. Rogers resumed command of the battery. 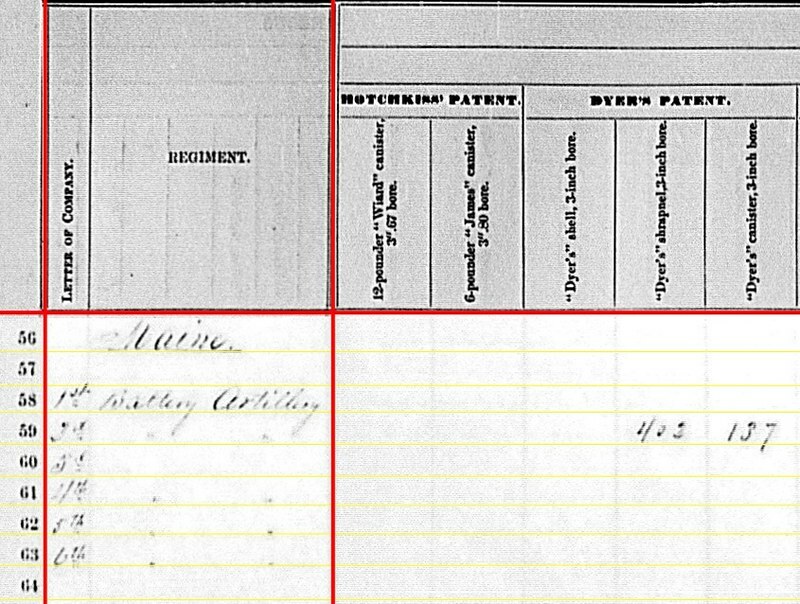 Of note, the 7th Maine Light Battery began formation in the fall of 1863. Though it would not formally muster until December. And, mentioned above in regard to the 3rd Battery, the 1st Maine Heavy Artillery, under Colonel Daniel Chaplin, was part of the defenses of Washington, D.C., assigned to the north side of the Potomac. The regiment had detachments in Maine on recruiting duties and at the seacoast fortifications (mostly recruits being trained up for duty). This regiment was destined to see combat in the year that followed, but as one of the “heavies” given infantry duties in the Overland Campaign. 5th Battery: 192 shot, 64 shell, 188 case, and 68 canister for 12-pdr Napoleons. 6th Battery: 192 shot, 64 shell, 192 case, and 64 canister for 12-pdr Napoleons. The number of rounds on hand for the Napoleons seems low to me. A standard Napoleon ammunition chest held 32 rounds. Each gun in the battery should have at least four such chests (one on the limber, three with the caisson) if not a few more. Do the math. 5th and 6th Batteries had roughly a chest per gun. Both returns were filed at the start of 1864, while the batteries were enjoying the winter encampment. And those batteries would have plenty of ammunition to fill the chests. I suspect in this case the returns were “as of the reporting date” and not “on hand at this time.” But without seeing the actual return, that cannot be determined for certainty. 2nd Battery: 71 shot, 99 canister, and 240 fuse shell for 3-inch rifles. 4th Battery: 120 canister, 381 fuse shell, and 699 bullet shell for 3-inch rifles. As with the Napoleon batteries, 2nd Battery seems short on ammunition, with a couple of chests worth on hand (though we’ll see enough for a couple more chests from the Schenkl columns below). 4th Battery had but six total. We rarely have seen solid shot reported for field batteries in the 3-inch or 10-pdr Parrott calibers. Solid shot, or bolt as the Parrotts were designated, were good for counter-battery work. Though they could not match the performance of solid round shot against infantry. 2nd Battery: 258 shot for 3-inch rifles. Taken with the 71 Hotchkiss, that’s a lot of solid shot! Almost two full chests worth. More Schenkl on the next page. 2nd Battery: 115 shell for 3-inch rifles. 2nd Battery: Sixteen Army revolvers and nine cavalry sabers. 4th Battery: Eighteen Navy revolvers and eleven cavalry sabers. 5th Battery: Ten Army revolvers and fifteen cavalry sabers. 6th Battery: Seven Army revolvers, a hundred Navy revolvers and twenty-two horse artillery sabers. All considered, the numbers for the Maine batteries offer some insight into logistics at this time of the war for the Federal ranks. Two of the batteries gave returns close to the end of the reporting period. And we have conjectural evidence the other two were giving “as of that date” returns. From those returns, we conclude the battery had one chest on hand for many of its guns. But before we go off worrying the Army of the Potomac had some shortage of shells, we have to keep in mind what we know outside of those batteries. The artillery chief (Brigadier-General Henry Hunt) was not filling the telegraph lines with pleas for more ammunition. Nor was the ordnance or quartermaster sections reporting any Army-wide shortage. So perhaps the Maine batteries were reporting what they had on hand, at the end of a summer of hard campaigning with little time to resupply. Meanwhile, the missing set of data here is what was retained on hand at the Army-level in Hunt’s famous artillery trains. Those chests, resupplied after Gettysburg, represented a ready supply to be quickly applied where need was felt. Perhaps the numbers indicate Hunt placed priority to resupply of the trains over filling chests in the batteries? Thus, if we take these numbers at face, on the eve of the Bristoe Station Campaign at least four batteries had simply enough rounds for a brief engagement. Though resupply was but a short ride away. Another “number” to consider is the reduction of three batteries to four guns. 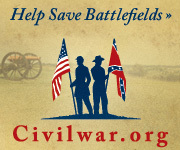 This trend would continue through the Overland Campaign and reflected policy changes. Seasoned, veteran infantry required less gun tubes per frontage for support. Fewer guns to support meant fewer ammunition chests. And such cycles back into the discussion of logistics, among other things. We turn the page – page in the ledger, that is – with this installment on the summaries and find the next recorded state set is Massachusetts. 1st Battery: Reported at Manchester, Maryland with six 12-pdr Napoleons. The battery was assigned to Artillery Brigade, Sixth Corps, Army of the Potomac. Captain William H. McCartney commanded. According to McCartney’s brief reports, the battery was “moving in a northerly direction through Maryland each day until July 2.” He reported firing only four solid shot at Gettysburg. 2nd Battery: No return. Captain Ormand F. Nims commanded this battery, assigned to the Fourth Division, Nineteenth Corps, Department of the Gulf. The battery may have retain six 6-pdr rifled field guns mentioned earlier in the year. The battery was part of the force laying siege to Port Hudson in June 1863. 3rd Battery: Indicated at Warrenton, Virginia with six 12-pdr Napoleons from an August 24, 1863 posting date. Assigned to the Artillery Brigade, Fifth Corps. When Captain Augustus Martin assumed command of the brigade, Lieutenant Aaron F. Walcott took command of the battery. June 30 found the battery moving through Maryland with the parent formation. Two days later, the battery was in action at Gettysburg. 4th Battery: At Port Hudson, Louisiana with four 12-pdr Napoleons and two 3-inch ordnance rifles. This battery was assigned to the Third Division, Nineteenth Corps. Captain George G. Trull was in command of the battery. But the nature of service had sections detached (and under the lieutenants of the battery). The previous quarter this battery’s guns were identified as 3-inch steel rifles. The most likely scenario is improper identification from the previous quarter, as often was the case with wrought iron guns. 6th Battery: At Port Hudson with four 12-pdr Napoleons and two 12-pdr field howitzers. The battery was assigned to First Division, Nineteenth Corps, under Captain William W. Carruth (however, Lieutenant John F. Phelps was listed as commander in the corps returns… and Carruth mustered out later in the fall). 7th Battery: Indicated at White House, Virginia with six 3-inch Ordnance rifles. Assigned to First Division, Seventh Army Corps, the battery was commanded by Captain Phineas A. Davis. At the start of July, the battery was among the forces employed for an expedition from White House to the South Anna River. 9th Battery: Warrenton Junction, Virginia with six 12-pdr Napoleons, as of the August 23, 1863 report. The 9th Battery was assigned to the First Volunteer Artillery Brigade, Artillery Reserve in mid-June. So their actual location for the end of the quarter was Taneytown. Captain John Bigelow commanded. Along with the brigade (and the 5th Battery), the 9th Battery was rushed towards the Peach Orchard on July 2. When Bigelow was wounded, Lieutenant Richard S. Milton assumed command. 10th Battery: Report dated August 18, 1863 placed this battery at Sulphur Springs, Virginia with six 3-inch Ordnance Rifles. The battery supported French’s Division, Eighth Corps, Middle Department (which would soon be folded into the Army of the Potomac). Sent to Harpers Ferry in mid-June, the battery was among those forces withdrawn to Frederick, Maryland at the end of the month. Captain J. Henry Sleeper commanded. 11th Battery: Indicted as “not in service.” This battery mustered out of service on May 25, 1863. After turning in equipment, the battery returned to Massachusetts where it remained in the state militia. Captain Edward J. Jones remained as commander. That said, the battery did see “action” that July… suppressing riots in Boston. The Battery would return to Federal service the following winter. 12th Battery: At Port Hudson, Louisiana, with four 6-pdr field guns and two 3-inch Ordnance rifles. Listed as unattached in the Nineteenth Corps. Actually, this battery was split into sections at this phase of the war. Captain Jacob Miller commanded the battery, from Fort Banks near New Orleans. Sections of the battery were forwarded to Port Hudson in support of the siege of that place, under Lieutenant Edwin M. Chamberlin. 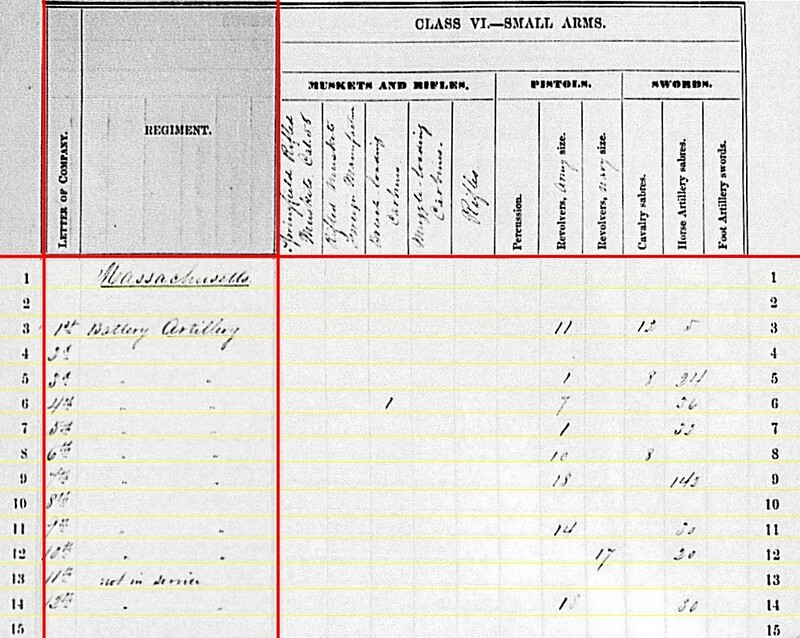 Not mentioned in this list, the 13th Massachusetts Light Artillery was not only in service but also “in action” at the end of June 1863. Captain Charles H. J. Hamlin commanded. After troublesome and delayed passage from Massachusetts, the battery arrived at New Orleans on May 10. There, the 13th was assigned garrison duties, with its horses turned over to the 12th Battery (see above). On June 5, the men of the battery moved by steamboat to Port Hudson. There, they served in two detachments – one under Captain Hamlin, the other under Lieutenant Timothy W. Terry – manning siege mortars. Not acclimatized, the men of the battery suffered heavily during the siege. The 14th and 16th Massachusetts would not muster until months later. 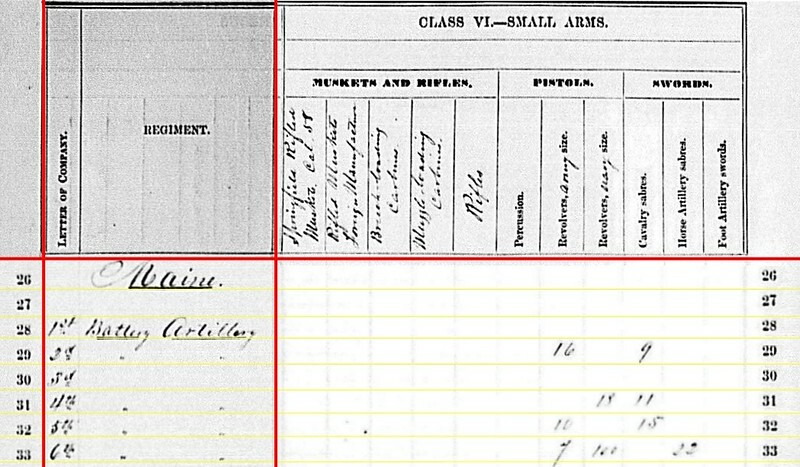 But the 15th Massachusetts Light Artillery may be included here. The 15th left Boston in March 1863, for New Orleans, under Captain Timothy Pearson. The battery arrived in May, but turned in equipment and horses (needed for the other batteries). For the remainder of the year, the 15th Battery served garrison duties around New Orleans and Lake Pontchartrain. 1st Battery: 287 shot, 96 shell, 288 case, and 96 canister for 12-pdr Napoleons. 3rd Battery: 192 shot, 96 shell, 387 case, and 96 canister for 12-pdr Napoleons. 4th Battery: 269 shell, 147 case, and 55 canister for 12-pdr Napoleons. 6th Battery: 198 shot, 106 shell, 150 case, and 58 canister for 12-pdr Napoleons; 90 shell, 136 case, and 40 canister for 12-pdr field howitzers. 9th Battery: 288 shot, 96 shell, 288 case, and 96 canister for 12-pdr Napoleons. Notice the 12th battery reported no ammunition for the 6-pdrs. 5th Battery: 121 canister and 322 fuse shell for 3-inch rifles. 7th Battery: 168 canister, 188 fuse shell, and 486 bullet shell for 3-inch rifles. 10th Battery: 115 canister, 110 percussion shell, 220 fuse shell, and 500 bullet shells for 3-inch rifles. 12th Battery: 30 shot, 34 canister, 60 percussion shell, 70 fuse shell, and 112 bullet shells for 3-inch rifles. We don’t often see solid shot reported from the field. But the 12th Battery had thirty. 5th Battery: 550 shrapnel for 3-inch rifles. 7th Battery: 221 shrapnel for 3-inch rifles. 10th Battery: 240 shrapnel for 3-inch rifles. What may, or may not, be a correlation here, the three batteries were all Eastern Theater. Though their service was varied. 5th Battery: 211 shell for 3-inch rifles. 7th Battery: 290 shell for 3-inch rifles. 10th Battery: 15 shell for 3-inch rifles. 1st Battery: Eleven Army revolvers, twelve cavalry sabers, and five horse artillery sabers. 4th Battery: One breechloading carbine, seven Army revolvers, and thirty-six horse artillery sabers. 5th Battery: One Army revolver and thirty-three horse artillery sabers. 6th Battery: Ten Army revolvers and eight cavalry sabers. 7th Battery: Eighteen Army revolvers and 142 horse artillery sabers. 9th Battery: Fourteen Army revolvers and thirty horse artillery sabers. 10th Battery: Seventeen Navy revolvers and twenty horse artillery sabers. 12th Battery: Eighteen Army revolvers and thirty horse artillery sabers. It seems the Massachusetts batteries received a healthy issue of horse artillery sabers. Perhaps proud products of Ames Manufacturing, of Chicopee, Massachusetts. 1st Battery: No return. Lieutenant John E. Morton remained in command of this battery, assigned to First Division, Nineteenth Corps, Department of the Gulf. And at the end of June, that formation was laying siege to Port Hudson. Reports earlier in the year gave the battery had four 6-pdr rifled guns and three 12-pdr howitzers. 2nd Battery: Hamilton (? ), Virginia with six 3-inch Ordnance rifles. This is Captain James A. Hall’s battery, First Corps, Army of the Potomac. This assignment had them marching up from Emmitsburg, Maryland, camping at Marsh Creek, on June 30. 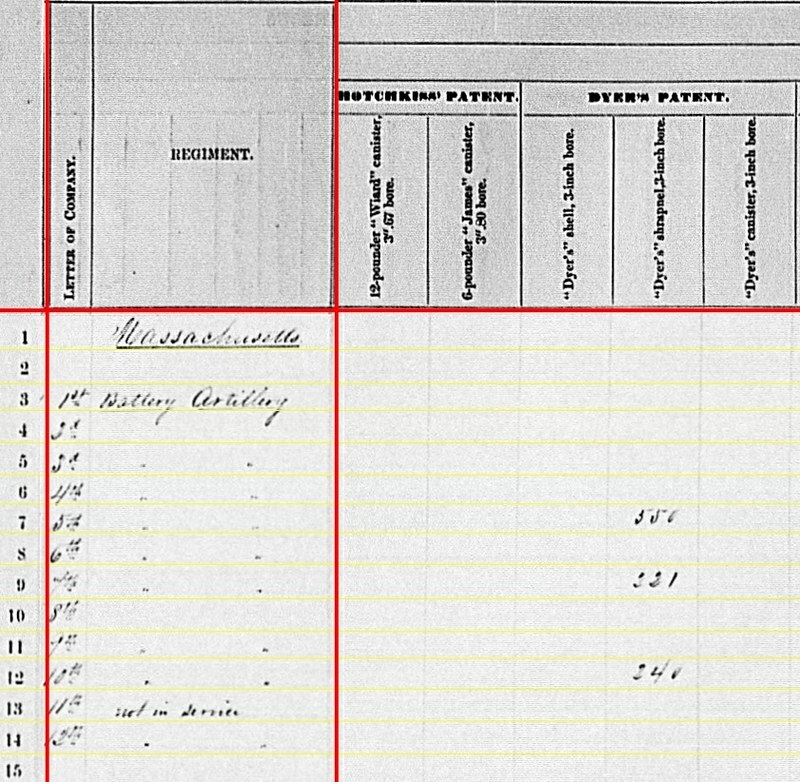 We might attribute the location to the date of the return’s receipt – October 1863. But keep in mind the modern village of Hamilton, in Loudoun County, was named Harmony during the war. In October 1863, the battery was in Culpeper county. 4th Battery: Reporting at Rappahannock, Virginia with six 3-inch Ordnance rifles. The location is likely connected to the receipt date of August 1863. Captain O’Neil W. Robinson, Jr. commanded this battery. Assigned to French’s Division, Eighth Corps, Middle Department, the battery was among those at Harpers Ferry at the start of June. On June 30, the forces there moved to Frederick, Maryland. Later in the summer, the battery transferred, with it’s parent, into the Third Corps, Army of the Potomac. 5th Battery: Reporting, appropriately “in the field” with six 12-pdr Napoleons. Captain Greenleaf T. Stevens assumed command of this battery during the Chancellorsville Campaign. And of course, the battery was part of Wainwright’s brigade, supporting First Corps. Stevens has a knoll named for him at Gettysburg. 6th Battery: At Taneytown, Maryland with four 12-pdr Napoleons. The battery was part of the 4th Volunteer Brigade, Artillery Reserve, then advancing across Maryland, so the location is very accurate. Lieutenant Edwin B. Dow remained in command. So we find four of these batteries involved with the Gettysburg campaign (with three actually on the field). One battery was at Port Hudson. Only the 3rd was not actually in a fight at the return’s due date. 5th Battery: 288 shot, 96 shell, 288 case, and 96 canister for 12-pdr Napoleons. 2nd battery: 359 fuse shell and 140 bullet shell for 3-inch rifles. 2nd Battery: 402 shrapnel and 137 canister of Dyer’s patent for 3-inch rifles. Some time back, I was asked what Federal batteries might have had Dyer’s projectiles at Gettysburg. Well there is the the lead – Hall’s battery. 2nd Battery: 156 Schenkl shells for 3-inch rifles. 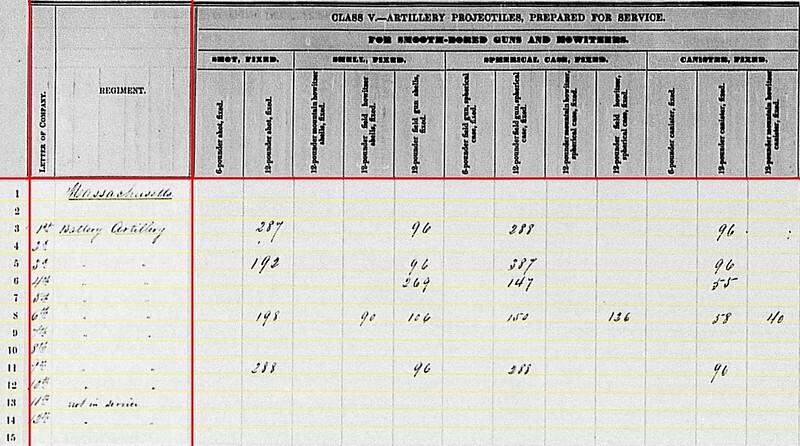 Since we are seeing a lot of Hall’s Battery here, I’d point out his expenditure and losses at Gettysburg. In his official report, the battery fired 635 rounds. Eighteen men wounded and four captured. Twenty-eight horses killed and six wounded. One gun-carriage destroyed, and two others disabled (probably due to axles). But no guns lost…. Hall and a sergeant personally brought one abandoned gun off the field. 2nd Battery: Sixteen Army revolvers and eleven cavalry sabers. 4th Battery: Eighteen Army revolvers and twenty-three(?) cavalry sabers. 5th Battery: Eleven Army revolvers and sixteen cavalry sabers. 6th Battery: Seven Army revolvers, 100(?) Navy revolvers and thirty-two(?) horse artillery sabers. The odd bit here is with all those pistols in the 6th Battery. The previous quarter, the battery had but seven.